Do you remember the Oak Leaf Coffee Bar on Saltdean seafront? The Oak Leaf was an immediate success when it opened its doors in the Spring of 1959 and became a popular haunt with local teenagers. We would spend all our pocket money on frothy coffee and Pepsi Cola, or putting it in the juke box playing favourite records over and over again. Many of the Oak Leaf lads owned motorcycles like the one shown here. I recall a popular pastime on summer evenings was to race the bikes between Rottingdean Windmill and Marine Gate flats. You could attain the “magic ton” on this long straight stretch of the A259. Of course this was before speed cameras were in operation. It was also before the Ovingdean roundabout was built, and many years before the road was diverted at Roedean Golf course. In those days however, you would need to keep a sharp look out for the Brighton speed cops on their powerful motorbikes. The splendid machine in the photo here is a 1959/60 BSA Goldstar DBD32 350cc, nicknamed ‘The Cafe Racer’. The more popular ‘Goldie’ was of course the more powerful DBD34 650 twin. Hi, you all look so young and happy. They must have been the best years of your lives. Cannot wait to see your 2011 photos.All the best for your reunion next month. Lovely photos. My husband had a Harley Davidson in 1961. Hi Chris, Sorry to correct you, but the DBD34 and DBZ34 Gold Stars were 500cc singles, which were last made in 1962. It was succeeded in 1962 when BSA introduced their A10RGS Rocket Gold Star 650cc twins, but these were only produced until 1963. Regards, Andy. Hi Andy. Thanks for that. Apologies for getting the Goldstar models slightly wrong, (I bow to your superior knowledge). On the subject of Brighton Speed Cops in the 1960s, I wonder, does anyone remember the big Sergeant who sported a handle bar moustache? I do remember he lived in Wilson ave. Off duty he drove a blue Austin Healey 3000. I can’t for the life of me remember his name although, he was very well known at the time. He would often stop and have a friendly chat to us Oak Leaf lads, advising on the perils of speeding along the Coast Road. I for one gained a healthy respect for that old adversary. However, if you chose to ignore him you would in time expect to receive a summons to appear before Brighton Magistrates Court resulting in a 30 bob fine, your licence endorsed and the stigma of your name published in The Evening Argus. Hi Julie, thanks for your kind comments. In 1961 a Big Harley Davidson would have been way out of my league. Kind Regards Chris. Hi Chris. The police sergeant with the handlebar moustache was known as `Mac’. His surname was McIntosh. He died several years ago. He lived just off Wilson Avenue. Sergeant McIntosh lived in Sadler Way just off of Wilson Avenue. He used to have a big savage Alsatian and a very attractive wife, who I believe still lives there. Calling all Oakleafers! The 2012 Oak Leaf re-union is to be held Saturday June 16th at St Nicholas Church Hall Saltdean Vale, kick off 7.30pm. A fish ‘n chip supper with pudding, tea / coffee will be served, “Please Bring Your Own Tipple”, £10 per head. There will be live entertainment + a fun quiz + raffle + a photo display by local historian Douglas d’Enno. Please e-mail me any old pix you may have of the Oak Leaf Cafe etc for inclusion – or bring them along on the night. If you were a teenager living in the Saltdean area during the late 1950s / early 1960s and remember the Oak Leaf Coffee Bar, you’re very welcome to come along. It would be great to see you! There is a link above, where you will find the Oak Leaf story and contact details. So come on all you Oakleafers, let’s be hearing from you! May I add a couple of corrections to the previous comments: Jack McIntosh was a Traffic PC. His pride and joy was an Aston Martin – not an Austin Healey. And his Alsatian, called Mac, was a mild lovely family friendly dog – certainly not a savage. As a schoolboy I was his neighbour – and subsequently served with him in the police. Jack’s wife and my mother are still neighbours. A message for George Smith re Jack Mcintosh Brighton Traffic PC. Many thanks for your corrections to previous comments. 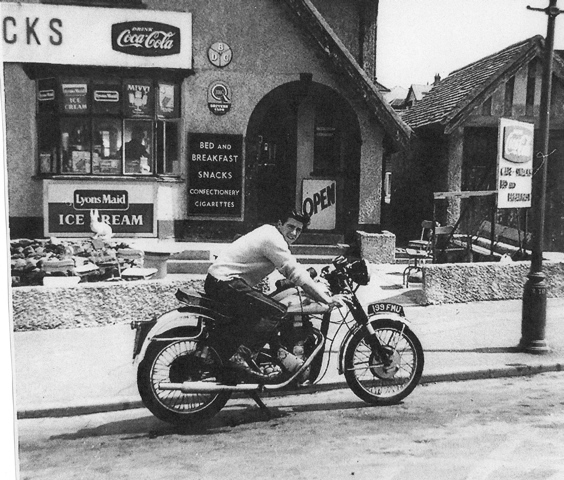 As a teenage biker I remember Mac well because he booked me twice in the early 1960s for speeding along the A259 between Black Rock and Rottingdean – no doubt well deserved. I had been warned by him several times before. I don’t remember his Alsatian although it’s good to know he was a friendly family dog. Please say hello to his wife for me and say sorry for mistaking Mac’s Aston Martin for an Austin Healey - it was all a very long time ago. I’m sure Mac would have been over the moon that the Brighton Speed Trials on Madeira Drive are to continue. Mr Mac may have subsequently had another Alsatian after the “Mild and gentle” Mac. All I know is that his Alsatian circa 1978/9 visciously attacked my mum’s timid collie and would certainly have killed her was it not for Mac and I physically wrestling the brute off in the middle of Wilson Avenue.